The mother of newborn octuplets and six other children collected almost $168,000 in state disability payments for an on-the-job back injury that she and a doctor said was worsened by pregnancy, according to state documents released Thursday. Nadya Suleman, 33, became pregnant with all 14 of her children after a 1999 injury during a riot at a state mental hospital where she worked, state Division of Workers' Compensation documents show. She stopped working, but had the six older children during that time, notes Early Show correspondent Hattie Kauffman. "There has to be some question," says CBS News Legal Analyst Trent Copeland, "about whether or not a woman who's disabled and collecting over $150,000 worth of disability payments is really authorized to receive those payments if she's too disabled to work, but not too disabled to have at least a half-dozen children." There were also mental health issues, Kauffman reports. Suleman was labeled as being at some risk for suicide, and diagnosed with a "depressive disorder." The octuplets' birth last week and subsequent disclosure that Suleman is a single mother who already had six children - all by in-vitro fertilization - prompted a torrent of criticism and ethical questions about why she would want so many children, why a doctor would implant that many embryos and how she would care for her family. 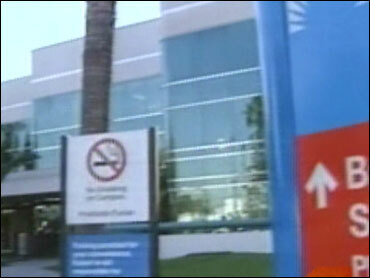 Suleman was released from the hospital Thursday, but didn't return to her Whittier, Calif. home. Instead, says Kauffman, she immediately sat down for her first media interview, telling NBC News she tried for seven years to have a baby and, after the first IVF was successful, she "kept going in." NBC News says it didn't pay for the interview, but her spokesman, Mike Furtney, made it clear to Kauffman that Suleman hopes to make money from her story. "What we'd like to see her wind up with is the means to raise her 14 children in the way that she wants to do that," Furtney said. Furtney also told Kauffman that Suleman would like to return to school some day and receive a degree in counseling. Meanwhile, the eight infants continue to make progress in the hospital, Kauffman adds. Suleman was an employee of Metropolitan State Hospital in Norwalk, Calif., from 1997 until December, when she resigned the position. Records show that for much of that time she was unable to work because of her injuries. The documents reveal much about the mother's past, including a doctor's claim that she had three miscarriages before she had her first child, the mental anguish she endured from those failed pregnancies and the elation she felt after the first birth. Suleman was injured at the hospital on Sept. 18, 1999, while helping restrain a patient as about 20 others wreaked havoc at the mental hospital. One of the unruly patients flipped a heavy desk that struck Suleman in the back. The injury caused her pain in her back and lower body and caused disc protrusions in three levels of her lumbar spine. Suleman took Celebrex, an anti-inflammatory drug, and Darvocet, a pain medication, for the injury. She went back to work almost immediately after she was injured, but the pain grew and traveled down her leg and she began to experience numbness in her right foot, the documents state. Two months later, she was back on disability. In the months after her injury, orthopedists recommended back surgery and injections of steroids into her lower back. But Suleman didn't want to undergo the treatments, saying the surgery seemed too risky. At one point, she rejected to have X-rays taken because she feared they would interfere with her fertility treatments. "The patient is reluctant to have surgery. She desperately needs surgery," orthopedist Dr. Daniel Capen wrote in February 2000. Before her injury, Suleman worked the graveyard shift as a psychiatric technician in the adolescent boys' ward. She told doctors she loved the work. During a hearing on her case in December 2001, Suleman said the pregnancy aggravated her back condition. She said she spent most of the day in bed and was unable to care for her first child, according to a report by workers' compensation judge Jerome Bulavsky. After examining her in August, Dr. Steven Nagelberg attributed 90 percent of her condition to the work incident and 10 percent to her pregnancy. Furtney said he could not comment until he and Suleman's lawyer had seen the document. The records include medical and psychological reports, as well as biographical information that sheds light on her background, which has been a public mystery before Thursday when the records were released and she left the hospital and gave her first interview. Suleman and NBC News that, as an only child, she "longed for certain connections and attachments with another person that I, I really lacked, I believe, growing up." When Suleman learned that she was pregnant with what would become her first child, she had feared she would lose the child and sunk into an intense depression, according to a psychological evaluation in her workers' compensation case. But the birth of the baby "helped my spirits," she said. Suleman's hopes also rose that her marriage would be improved by the baby. Suleman was married to Marcos Gutierrez in 1996, and the couple separated in 2000 but remained friendly, according to the documents. Gutierrez filed for the divorce, which was finalized in January 2008. His residence is unknown. She told psychiatric evaluators that her marriage was great before the injury, but later as her back injury worsened and she descended into depression, she felt she had little to offer him. "I don't want to keep bringing him down. I want him to move on with his life," she told Dr. Alfred Bloch, according to a 2001 report.